The efficient China self-cleaning vibrating screen is mainly used for pulp tailing processing, with large filtering area, low power consumption and clean impurity. 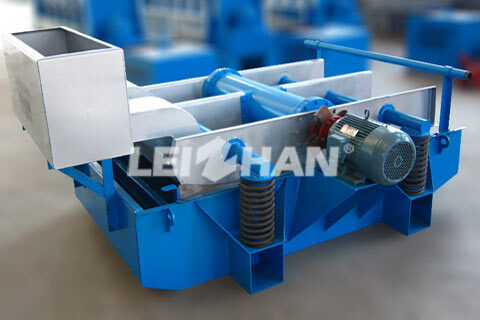 China ZSK series self-cleaning vibrating screen consists of cleaner body, vibration producer, dampener, stock chest, stock level controlling device and water jet device etc. And the cleaner body consists of screen frame, screen plate and gas seal room which is connected by bolt. The screen frame is located on 4 dampeners, and vibration producer is located on the heart of screen frame. When the cleaner working, the stock runs to the bottom of gas seal room by stock level controlling device, and the screen body is vibrated under the affect of vibration producer, then the pressure pulse is formed. This cleaning method by pressure pulse can not only makes the screen plate more cleanly but decreases the load on the screen plate.